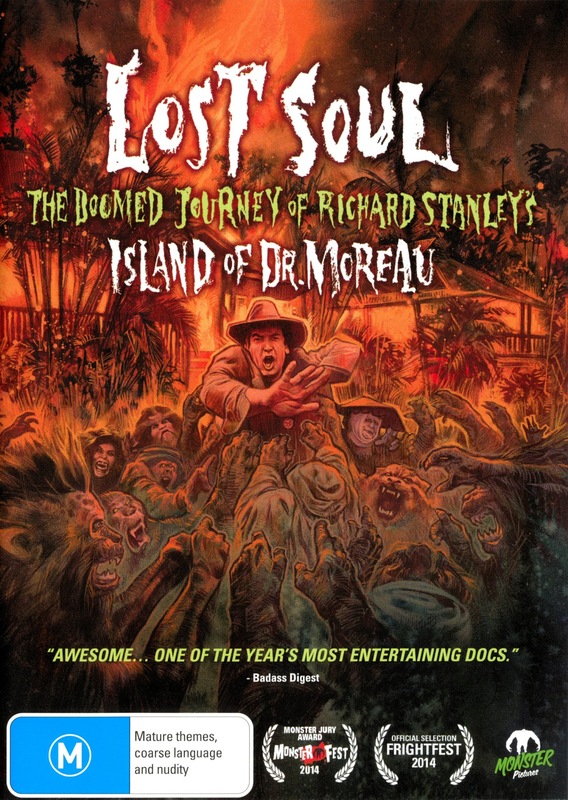 Speaking of movies about movies, here's an interesting new release about the infamous Island of Dr. Moreau starring Marlon Brando. 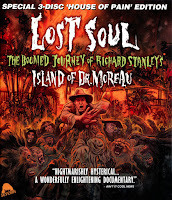 It's a documentary called Lost Soul: The Doomed Journey of Richard Stanley's Island of Dr. Moreau, and like its very long title implies, it focuses on the early vision of original/ fired director Richard Stanley that never made it to the screen, as opposed to the John Frankenheimer version that did. 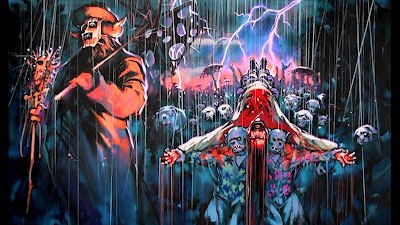 As you might imagine - especially if you've ever seen the 1996 Island of Dr. Moreau - this story's a bit of a wild ride; and it's just arrived on DVD from Monster Pictures and Severin in Austalia. The '96 version of Island of Dr. Moreau is an infamous film in its own right. It's a bizarre mess, that's kind of terrible but kind of compelling for all the bizarre-o decisions made by all the creatives involved in this picture. Marlon Brando's painted in white, bucket on head performance with the original "mini me" sidekick is legendary. And the campy science fiction/fantasy story of a thousand different types of mutated animal people, based though it may be on H.G. Wells' novel, is the perfect Petri dish for everyone involved to descend into a thousand self-indulgent messes, all edited together into one barely comprehensible motion picture. It's a truly bad picture that every cinema lover should see at least once. 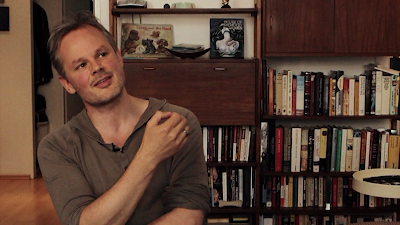 It's certainly the kind of film we want to explore more, in terms of behind the scenes tales and trying to figure out exactly what we're seeing on screen, so it's great to finally have a documentary that tackles it. Basically this new film does two things: dishes all the dirt you could want on the film's production: who behaved terribly, who got fired, who continued to appear on set and even in the film dressed as one of the film's many animal monsters after having been fired. We get to hear from the film's multiple producers, many of the crew including the original director, and several of the cast members including Rob Morrow (Northern Exposure) who was the original star of the film, even though you never see him in the final version. 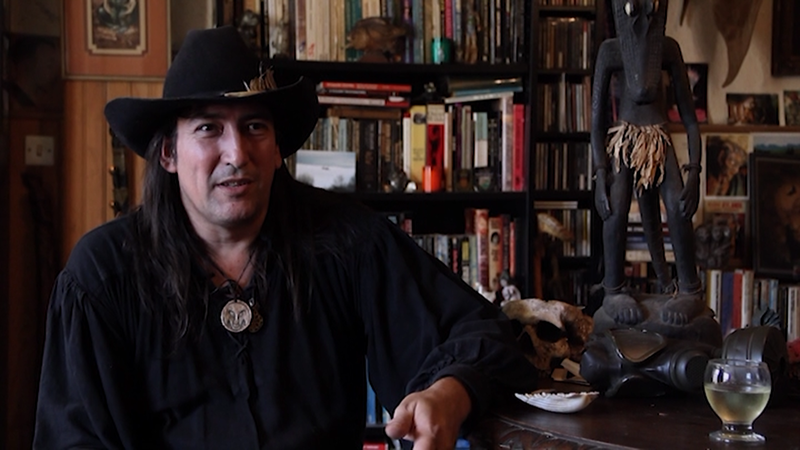 The other thing this documentary does is make a case for the unmade version of The Island of Dr. Moreau, as envisioned by Richard Stanley (director of Hardware and Dust Devil), who started the project in the first place. We see lots of artwork and hear plenty of imaginative concepts that were originally intended for the film. In this sense, it's a lot like Jodorowsky's Dune or Lost In La Mancha, giving us the fragmented remains so we can piece together as much as we can of a film that was never made. Some of it sounds pretty cool, but considering how weird Stanley proves to be during the course of this doc, and how out of control the project was, I'm not sure I'm convinced the film would have turned out much better had things gone his way. It probably would've been just an alternate crazy mess. But it all adds to the imaginative fun and mystery of this doc, and it's great to at least be able to appreciate some talented peoples' art that had been brushed under the rug. 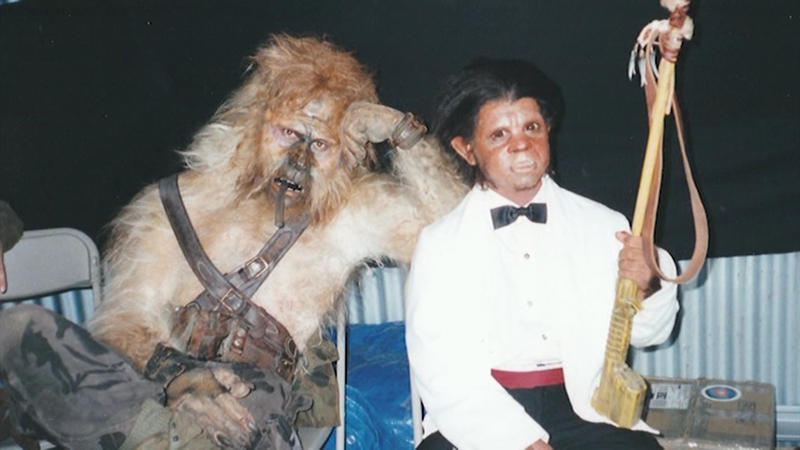 They get a lot of people who have a lot to say on this film, right down to some of the extras who played background monsters. You can't help but feel a little disappointed that some obvious interview subjects are missing, people who you really, really wind up wanting to hear their side of the stories. But, considering this is an independent doc and what a notorious flop the actual film was, it's not surprising that they couldn't get the big names like Val Kilmer or David Thewlis to talk to them. They would've surely made the film even better; but it's actually impressive that the filmmakers managed to get all the people they did. The film's presented in anamorphic 1.78:1 and looks pretty good. It's a bit frustrating, because the film's been released on all the major streaming and download sites in HD, so this doesn't look as nice as any of those options. You'd think for fans paying more to support physical, collectible media, you'd at least be getting the best version of the film than the casual viewers who just watch it once and don't care; but that's not the case in DVD-only releases like these today. By DVD standards, though, there's certainly nothing wrong with it. It's a new digital film transferred to disc with no problems and looks as good as DVD can. ...Well, except for the trailer, none of those are on here! And they sounded rather interesting. I was quite keen to see these when my DVD arrived, and am now pretty thoroughly disappointed. All that's on this disc is a set of five trailers, one for this doc and the rest are other titles Severin and Monster are releasing on disc. Really, guys, boo. That's drifting right into rip-off territory. I really think they at least owe us an explanation, if not refunds. Update 8/3/15: Unsurprisingly, Severin never coughed up that explanation... but they did cough up a "Special 3-Disc 'House of Pain' Edition" blu-ray! It's brand new and this time it's a US release. There's a single disc edition, too; and actually I was going to just grab that one, but since that one is selling for $24.95 on Amazon and the 3-disc set's going for for $24.99, I figured I might as well splurge. US blu on top; Australian DVD below. And unlike the DVD, this set actually contains the special features it promises - now there's a novel approach! First up are the outtakes, which are pretty good. 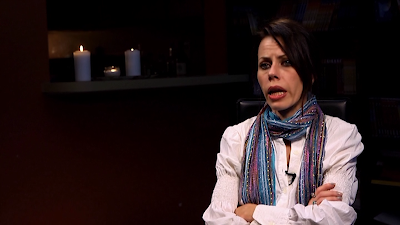 They're basically just additional interview clips, divided by speaker. A couple, like Richard Stanley's, are about 15 minutes. Others are less than 90 seconds; but they're all worth watching. There's a vintage interview with Frankenheimer about the film, and even though it seems like it was shot promotionally, he's asked about the problems on set, so it's good to finally get his voice in here. And speaking on getting additional voices into the mix, there's also an audio-only interview with Barbara Steele, who was originally going to have a cameo in the film. 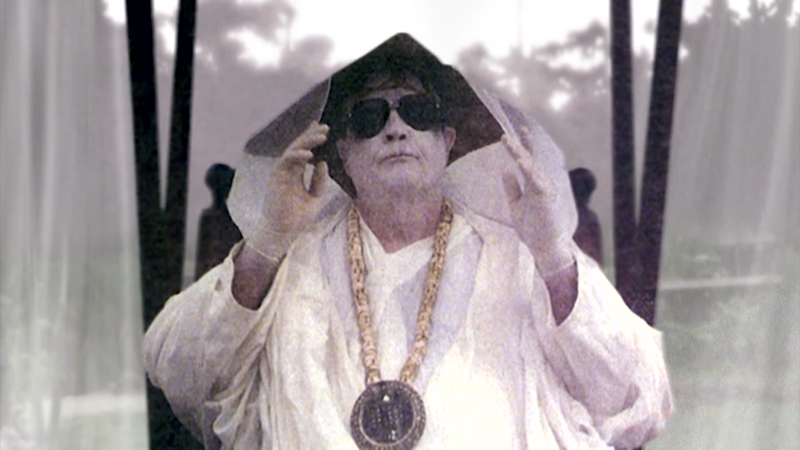 Then there's a featurette on Stanley wearing the Moreau make-ups to a film festival, which I suppose is the Q&A listed on the DVD specs, since he takes some questions at the end. And there's a good little short where three guys try to find the original filming locations. There's also a section where one of the extra reads from his diary from the filming, which is a little dry, and a cool one where Stanley narrates and explains their concept art. Then the trailer wraps up disc 1 and everything you'd get on the single disc set, which is pretty much all the essentials. 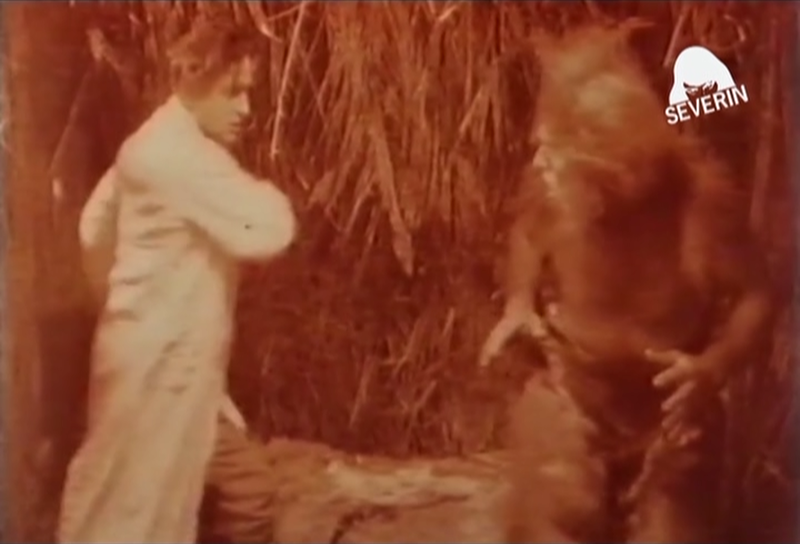 Disc 2, which is a DVD, centers chiefly on Island Of the Lost, a 1921 silent German film based on Wells' story. I can't say it's all that exciting, but certainly interesting for anybody into the history of either early sci-fi/ horror cinema, or Wells in particular. Removable subtitles are thankfully provided for the on-screen text, but shockingly and disappointingly, Severin puts a very conspicuous watermark over the image for much of the picture. It's not on screen 100% of the time, but it keeps recurring. Really, who watermarks their releases like this in 2015? Even public domain cheapies like Mill Creek have abandoned this practice. The only reason it doesn't bother me even more is that I wasn't so interested in this film in the first place; but for anybody who'd been really looking forward to seeing this will be pretty disheartened, I'm sure. Better than not including the film at all, of course, but come on guys. There are a couple extras on disc 2, which are nice. 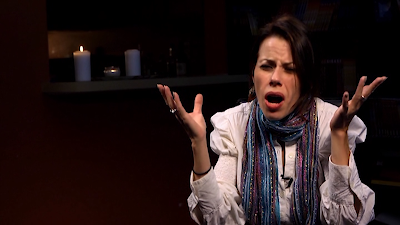 There's a featurette about Wells by a film scholar, which is pretty engaging, reminiscent of the ones Ballyhoo sometimes makes for Shout Factory's Mystery Science Theater DVDs. And there's another interview with Stanley, this time just talking about Wells, which is a little dull but fitting. And finally, there's a pretty neat easter egg: Le Voleur Invisible, another silent film, this time from 1909. Here a character, inspired by Wells' Invisible Man, turns himself invisible and starts robbing everybody. It's only 7 minutes long, so there's not a whole lot of story; and I think it mainly exists to showcase their special effects, presumably cutting edge for 1909. Anyway, it's fun and a neat hidden treat. Disc 3 is actually just a CD. It's essentially a complete audio book of H.G. 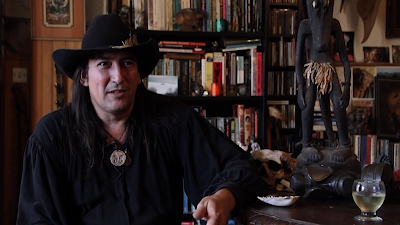 Wells' Island of Dr. Moreau novel, read by Richard Stanley. So, I definitely recommend this film, and the blu-ray is really a top-notch presentation of it, including - finally - a rewarding collection of extras. 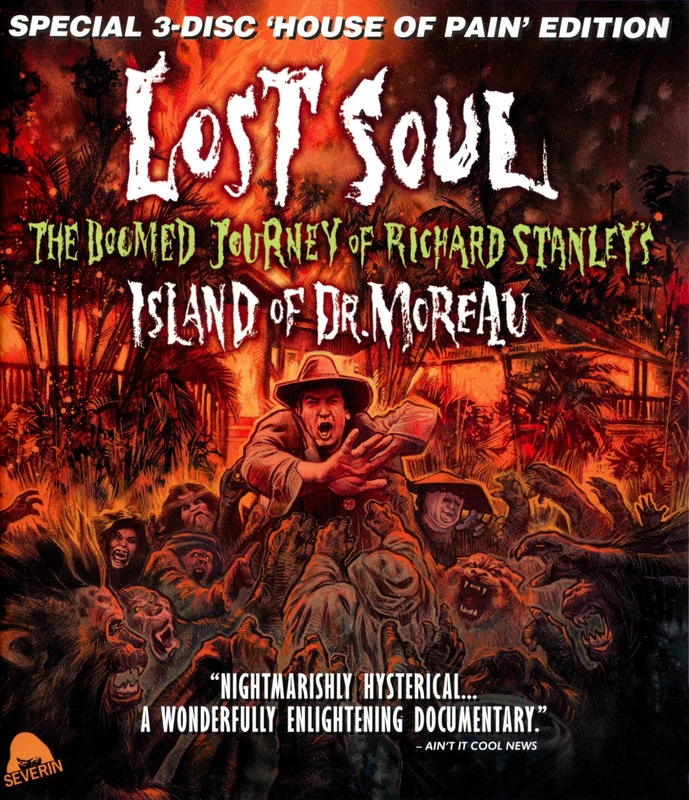 All the best stuff, by far, is on the first disc, though; so I'd only recommend the 'House of Pain' version if you're interested in Island Of the Lost (not to be confused with the 1932 Moreau adaptation Island of Lost Souls that Criterion put out). Or, if like me, you happen to come across the 3-disc edition even cheaper than the single disc. I wound up ordering it from Diabolik for $22.99.